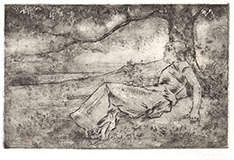 Etching (acquaforte monotipata), 1880; a fine impression of the first state of two, richly and skillfully printed, working on the surface tone with monotypic effects, on thick and soft wove paper. Signed LConconi in the film of ink left in the plate in wiping. With large margins, in very good condition. To the platemark 383 x 276 mm, the entire sheet measuring 652 x 465 mm. 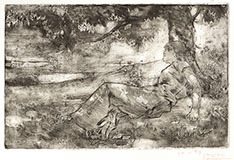 See M. Bianchi, G. Ginex, Luigi Conconi incisore, Milan, 1994; cat. no. 7. I am not sure about the existence of the second state described and reproduced by Bianchi and Ginex. 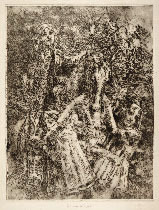 I deal with Conconi prints since several decades and I never met an impression of it. Also, considering the reproduction of this supposed second state in the book by the two scholars, I strongly suspect that it is a photomechanical reproduction of a drawing, not an etching. 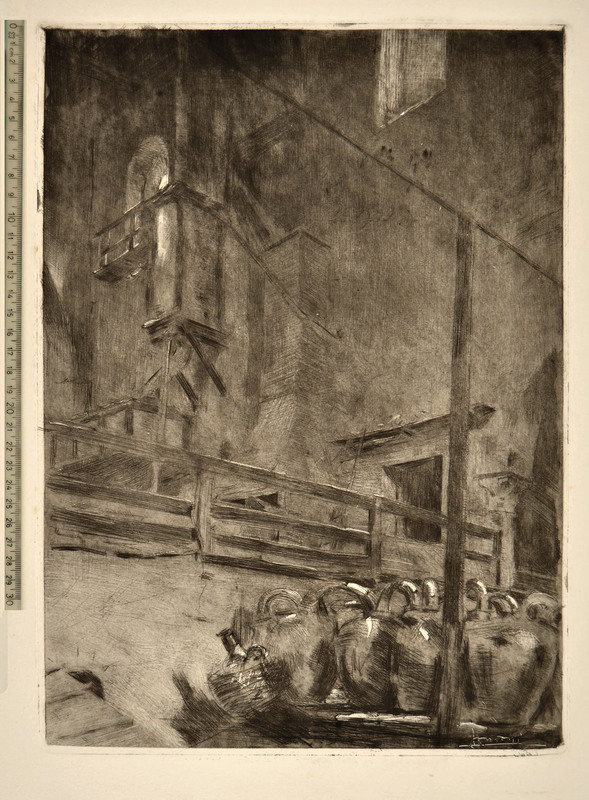 The print shows the interior of the desecrated Milanese church of San Vincenzo in Prato, turned into a chemical factory. 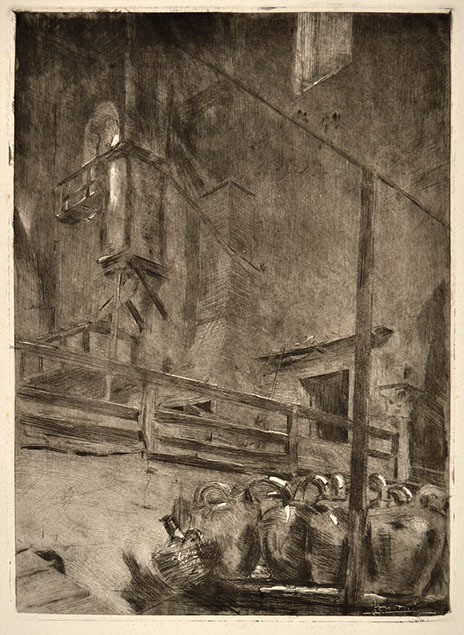 The decay of this building has been repeatedly depicted by Conconi in paintings and etchings. 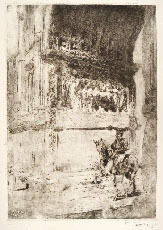 See, for example, the etching Le streghe. The chemist who worked in the church was Paolo Gorini (1813-1881), the creator of a method for keeping the corpses. Luigi Conconi was an architect, painter and illustrator. Born in a Milanese middle-class family, he was the nephew of the painter Mauro Conconi. Luigi studied architecture at the Accademia di Brera and at the Politecnico in Milan, and he used his architectural training occasionally throughout his career. 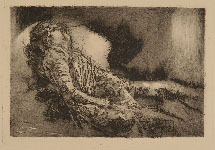 After attending the Politecnico, he became acquainted with the literary and artistic circles of the Scapigliatura: Tranquillo Cremona and Daniele Ranzoni influenced his early paintings. 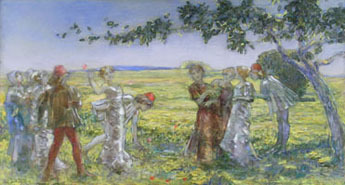 In the 1880s Conconi moved from the Realism of Scapigliatura toward Symbolism, developing an interest in visionary themes. 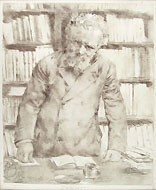 He received international recognition from awards in Paris in 1900 and in Munich in 1913. Conconi was also a skilful and sensitive printmaker, who revived the art of the etching in Lombardy, being the leading exponent of the acquaforte monotipata, an etching printed leaving a surplus of ink on the plate to create evocative effects. Conconi printed personally almost all his own plates.